Have you tried quinoa? 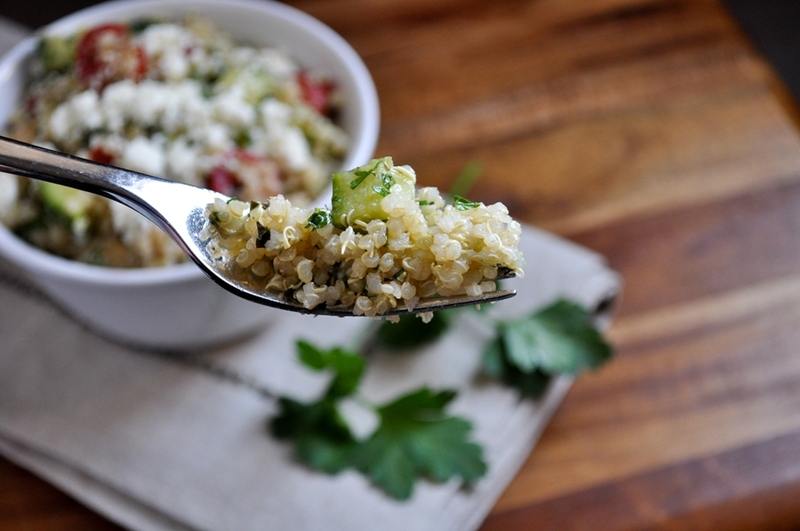 Do you know how to pronounce quinoa? Cause I sure didn't. I've been calling it "quin-noah" in my head for a while now. But apparently I've been saying it all wrong in my head. It's actually pronounced "keen-wah." I just keep saying it over and over hoping that it will stick. But I really want to keep saying it the way it's spelled. Oh well, any way you say it, I'm glad I finally gave "keen-wah" a try. What is keen-wah anyway? It looks like a grain. But it's not, technically. It's a seed. But you can call it a grain if you want. I plan to. It's a little weird to say you are going to eat seeds for dinner. This funny sounding little grain-like seed originates from South America according to Wikipedia. It cooks a lot like rice, using a ratio of 1 part quinoa to 2 parts water (or chicken or vegetable stock). It puffs up into fluffy little bits that have a slightly chewy texture and mildly nutty flavor. It looks super healthy. And apparently it is. It is rich in nutrients, like essential amino acids, phosphorus and iron. It also boasts a high protein content, making it a healthier alternative to rice or couscous. One of my goals this year is to incorporate some new foods into our household. Not like new candy bars or ice cream flavors (though there are plenty of flavors out there I wouldn't mind trying). New foods, like healthy stuff. Healthy stuff that still tastes good, like a candy bar. Okay, quinoa does not taste like a candy bar. But it is a great substitute for couscous or rice. And it does taste good! I've cooked quinoa 3 times now. The first time was a bit of a disaster. We ended up with quinoa mush. The liquids did not absorb properly. I'm certain it was operator failure. The other 2 times have gone much better and the quinoa fluffed up just like it was supposed to. It can be served hot or cold. It serves as a blank canvas for whatever flavors you want to combine with it. I didn't want to get too crazy in my first attempts cooking with quinoa, so I substituted it in a recipe that I make all the time and normally has couscous as the base. 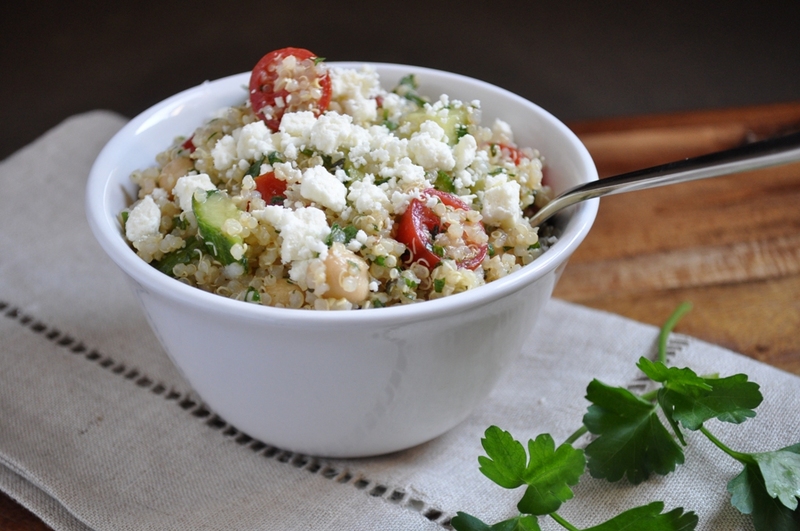 Tabouli salad. The funny thing is I actually like the salad even better with my new best friend, "keen-wah." I am looking forward to more quinoa experimentation. Bring 3 cups of water to a boil in a 2 quart saucepan. Add quinoa and return to a boil. Reduce heat to medium/low and cover pan and simmer for 12 minutes, or until the water is absorbed. Let stand covered for 10 minutes. Fluff with a fork and set quinoa aside until you are ready to assemble the salad. 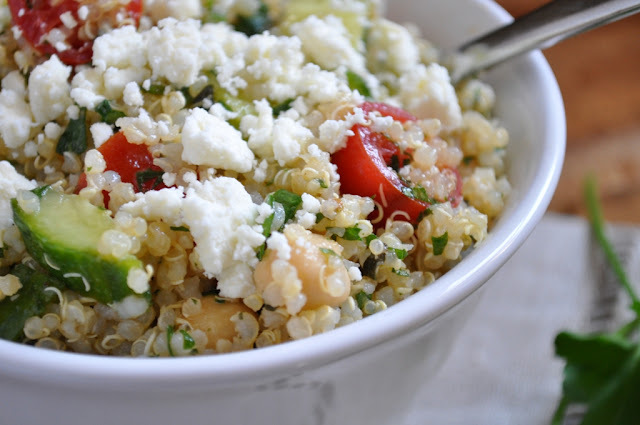 In a large mixing bowl add quinoa, green onions, mint, parsley, cucumber, tomatoes and garbanzo beans and stir to combine. Pour dressing over salad and stir until evenly distributed. Lastly, top with feta cheese. Same here! I was pronouncing it how it is spelled until I posted a recipe using it and thought maybe I should look it up to tell my readers. I still forget sometimes. :)I LOVE tabouli and love this idea. I will have to try it. This is right up my alley! Love salads like this that can be a full meal because of everything they provide. Love the close up shot! I just made the dressing alone and it's amazing! The quinoa is still cooking but I know this salad will be great because of the taste combinations. Thanks for posting and this has made it into my list of dishes to make often, especially when it's so hot outside. It's me again. I posted the comment about the dressing being delicious. After I started I switched out the mint for cilantro because we're all a bit cilantro crazy around here. My husband and son don't like whole chickpeas but they do like my hummus so I put that on the side. All of that said to lead up to...this salad is incredible! I could sit and eat the entire bowl. Amazing, stupendous, outstanding. Oh, by the way, I cooked up a chicken breast for my husband on the side but my son and I are vegan so this is one of those meals that will satisfy all of us. Thanks again for the recipe.